Seoul is coming under pressure from all sides on the question of missile defense. Last month, I argued that North Korea’s combined nuclear and missile program was reaching a tipping point. Previously these systems could be defended – at the outer reaches of rationality, to be sure – as protection against possible American-led regime change. In practice, they were primarily tools for the extortion and blackmail of Pyongyang’s neighbors, most obviously South Korea. North Korea’s gangsterism, while objectionable, has generally been manageable. But if (when?) the Northern program expands into more, faster, and more powerful warheads and missiles (as seems likely), then it would morph into a serious, possibly existential threat to South Korea (and Japan). A North Korea with a few missiles and warheads is unnerving, an obvious concern for proliferation and blackmail, but not a state- and society-breaking threat to the neighborhood. But a North Korea with dozens, or even hundreds, of such weapons (in the coming decades) is a threat to the constitutional and even physical survival of South Korea and Japan. My greatest concern then for regional stability is that at some point Seoul elites will be so terrified of a spiraling arsenal of Northern nuclear weapons (following the logic of the security dilemma), that they will consider pre-emptive air-strikes (as Israel has done in Iraq and Syria). The possibility of a Northern response and slide into war is obvious. There is an alternative however – the deployment of robust missile defense. While hundreds of incoming missiles would overwhelm any current missile defense system, the technology is advanced enough now for at least modest coverage. This would buy time, providing South Korea with at least a basic “roof’’ against Northern threats. Precisely this debate has roiled South Korean foreign policy in recent years, and it appears to be coming to head in 2015. The U.S. would like to deploy its Terminal High Altitude Area Defense (THAAD) missile defense system. But THAAD has become quite controversial locally, because the Chinese strongly oppose deployment. The South Korean left especially, traditionally wary of too much association with the Americans, has hesitated. But Beijing’s imperiousness on the issue is becoming itself an issue in Korea. At the moment, public opinion here seems to be slowly drifting toward deployment. The Chinese seem to have overplayed their hand, and the South Korean left has struggled recently with the wide perception that it is too “pro-Pyongyang.” Some kind of deployment seems increasingly likely. As a sop to China perhaps, the South Koreans have joined its new Asian Infrastructure Investment Bank (AIIB), against Washington’s objections; Seoul has also publicly insisted that it will not pay for the THAAD deployment. If this mollifies Beijing, so be it, as it is a rather good deal: THAAD in exchange mild South Korean free-riding and AIIB (which is not nearly as damaging to the U.S. as Washington seems to believe). For perspective, it is worth nothing that South Korea does already have some local missile defense coverage from Patriot missiles (PAC-2 and -3), but these only provide narrow and low altitude defense. Similarly, Korea has tried on and off for years to develop its own Korean Air and Missile Defense (KAMD), but it has never really panned out. It would cost a great deal and likely simply replicate most of what the Americans are offering right now for almost nothing. Meanwhile the case for high altitude defense grows more obvious with each day that North Korea’s programs continue. Whereas the PAC-3s would provide some defense just as the inbound missile approached its target, THAAD would reach higher up, giving South Korean defenders more chances to shoot down the missile. First, as Scott Snyder and many others have noted, the objective case for some sort of missile defense roof is pretty clear now. North Korea’s programs continue; there is little external surveillance. North Korea is in neither the International Atomic Energy Agency nor the Non-Proliferation Treaty. China and now Russia’s rejection of THAAD in South Korea have had to rely on transparently weak excuses that THAAD might be used against their own deterrents. This is so technologically inaccurate that it is hard not to read this as local bullying. One extra benefit to South Korea’s acceptance of THAAD would be to signal that it will not knuckle under to authoritarian intrusion. Second, the South Korean left still does not believe North Korea will use its missiles against South Korea. THAAD has really brought to light the deep, partisan-philosophical split in South Korea over North Korea. For years, I have had students and acquaintances tell me that North Korea, as a fellow Korean people, would never use its nuclear weapons against the South. They are aimed at Japan or the U.S. Former President Roh Moo-Hyun once notoriously said that Japan and the U.S. were the greatest threats to regional security. If this is true, then missile defense is indeed unnecessary and provocative. But it is a huge gamble on a regime notorious for its opacity and brutality. 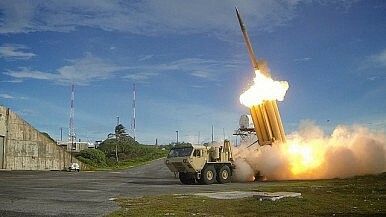 Third, South Korea does not want to pay for THAAD. I noted above that Seoul has rejected the suggestion that it would pay. A positive spin on this is that it is a rhetorical sop for Beijing, but it also may represent genuine opinion. South Korean and the U.S. have tussled for years over perceived Southern free-riding, and it is rather brash for South Korea to enjoy world-class defense while so brazenly saying it should not pay for it. Fourth, Korea is an early test of Chinese “hegemonic” intentions. THAAD is not designed to shoot down intercontinental ballistic missiles in mid-flight, so China’s formal objections are rather shallow. Expert opinion has suggested instead that the THAAD fight is a Chinese trial balloon over South Korea’s future course. Certainly this tussle is yet another marker of Chinese rise toward regional preponderance and the pressure it can bring to bear on small peripheral states such as South Korea (or Vietnam and the Philippines in the South China Sea disputes). Finally, THAAD is yet another example of why South Korea and Japan should work together. Seoul would be better able to resist Beijing’s domestic interference if Japan, which worries a lot about China, stood more directly with South Korea. Trilateral missile defense makes objective sense anyway, as North Korea’s missiles threaten Japan too. Ultimately, THAAD deployment is likely. KAMD increasingly looks like a political move – a feint to keep all sides happy and forestall a difficult decision. But North Korea’s continuing programs make it harder and harder to put off that decision. And what South Korean president wants to publicly admit that trade with China should trump national security? For all of China’s economic and geopolitical leverage, the decision is actually not that complicated. And the U.S. will likely keep coming back and back to this issue, to provide at least U.S. forces in Korea with greater protection, if not Korean citizens.